for all conditions and worksites. 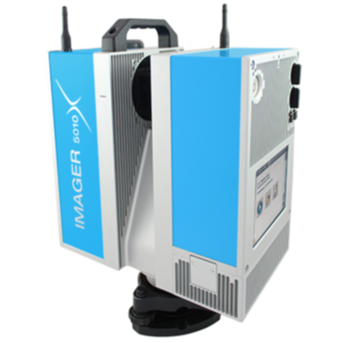 The Z+F IMAGER® 5010X comes with a unique navigation system which works outdoors and, as an industry-first, also indoors! It will estimate the current position and orientation of the scanner to support the registration algorithm to automatically find the correct solution. The scanner will also track your movements while carrying the device on to the next setup and hence provides position estimation for the registration process. With Z+F LaserControl® Scout and the new 3D laser scanner Z+F IMAGER® 5010X , Zoller + Fröhlich starts a laser scanning revolution with the Blue Workflow and automatic on-site registration! With a maximum measurement rate of 1,016,027 pixel/sec some laser scanners of Zoller + Fröhlich are one of the fastest in the world. Most laser scanners of Zoller + Fröhlich are classified “eye-safe“ according to laser class 1 requirements.